I have various items now surplus to my requirements from my 2011 690 Enduro R.
Akrapovic Exhaust Silencer with carbon end, carbon strap, original Akrapovic spring and clamp - KTM part number: 76505099000 - KTM ENDURO/R 690 2008-2011 KTM SMC/R 690 2008-2011- £380 delivered. 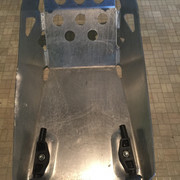 KTM Powerparts Pannier Racks - KTM part number: 76512920000 - These are brand new I fitted them to the bike but never used them and took them off when the bike was sold. They are £225 from KTM so grab a bargain at £175 delivered. KTM Power Parts Aluminium Sump Guard - This is used as it was on the bike when I bought it so has a few marks as you would expect. Complete with fixing bracket and new rubber mounts. KTM part number: 76503090100 - £60 delivered. All prices include delivery to UK mainland other locations may need an additional charge. If you want any more pictures of any of the items please message me. Items are listed on other forums so add a post or private message me if you want dibs but the first person to pay for any item will own it. Preferred payment by PayPal gift or bank transfer. Sold most of the parts I had within 24 hours for the asking price so maybe the other stuff was priced a bit high? 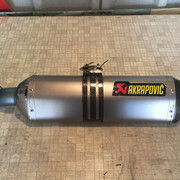 Akrapovic Exhaust Silencer with carbon end, carbon strap, original Akrapovic spring and clamp - KTM part number: 76505099000 - KTM ENDURO/R 690 2008-2011 KTM SMC/R 690 2008-2011- £340 delivered. 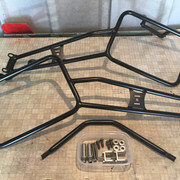 KTM Powerparts Pannier Racks - KTM part number: 76512920000 - These are brand new I fitted them to the bike but never used them and took them off when the bike was sold. They are £225 from KTM so grab a bargain at £160 delivered. KTM Power Parts Aluminium Sump Guard - This is used as it was on the bike when I bought it so has a few marks as you would expect. Complete with fixing bracket and new rubber mounts. KTM part number: 76503090100 - £50 delivered. All prices include signed for delivery to UK mainland other locations may need an additional charge.